The story of England’s hero-king and the greatest upset in European military history is Shakespeare’s finale to his great history plays. 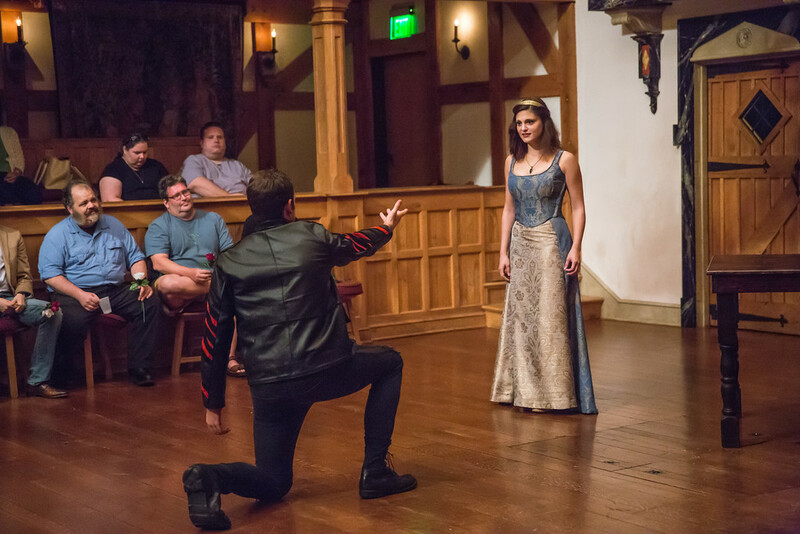 More than that, Henry V – at once touching, heroic, savage, and comic – explores the nature of greatness and its connection to theatre; and, perhaps more than any other of Shakespeare’s works, it makes the audience part of the story. The cast of HENRY V. Photo by TOMMY THOMPSON. 2016. 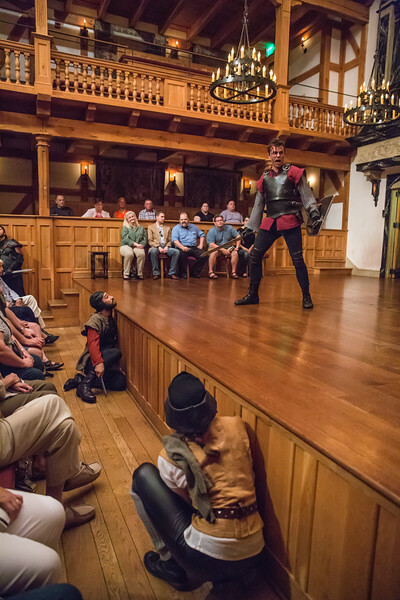 Ross Neal in HENRY V. Photo by TOMMY THOMPSON. 2016. 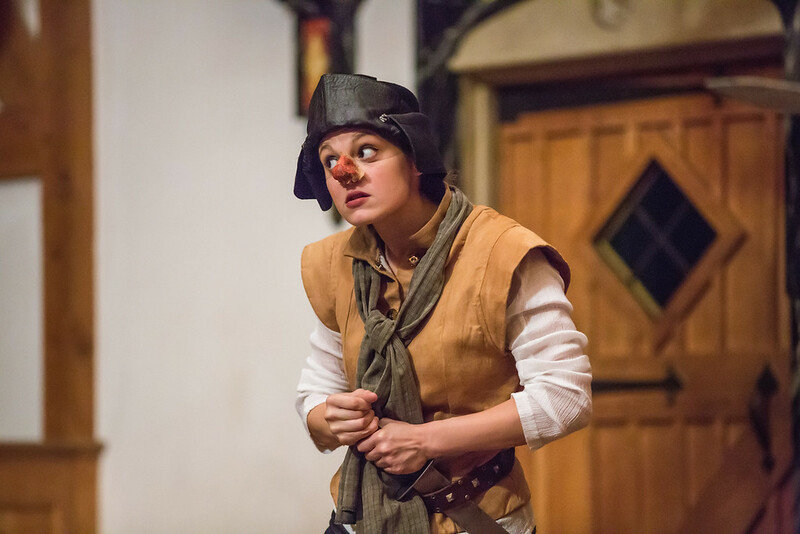 Zoe Speas in HENRY V. Photo by TOMMY THOMPSON. 2016. 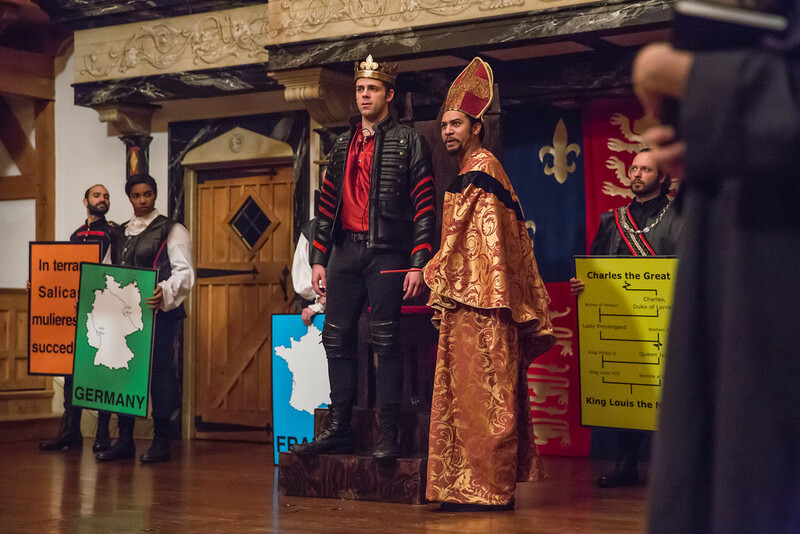 Tim Sailer, Zoe Speas, and Ross Neal in HENRY V. Photo by TOMMY THOMPSON. 2016. 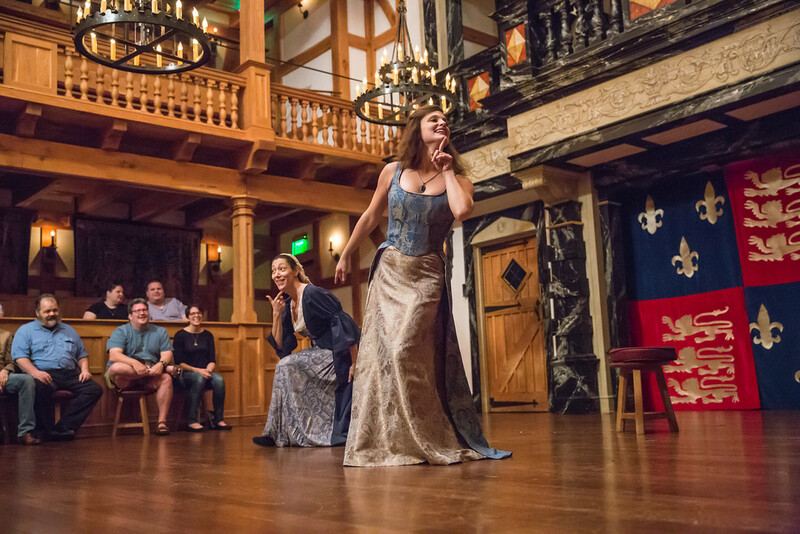 Jessica Lefkow and Zoe Speas in HENRY V. Photo by TOMMY THOMPSON. 2016. 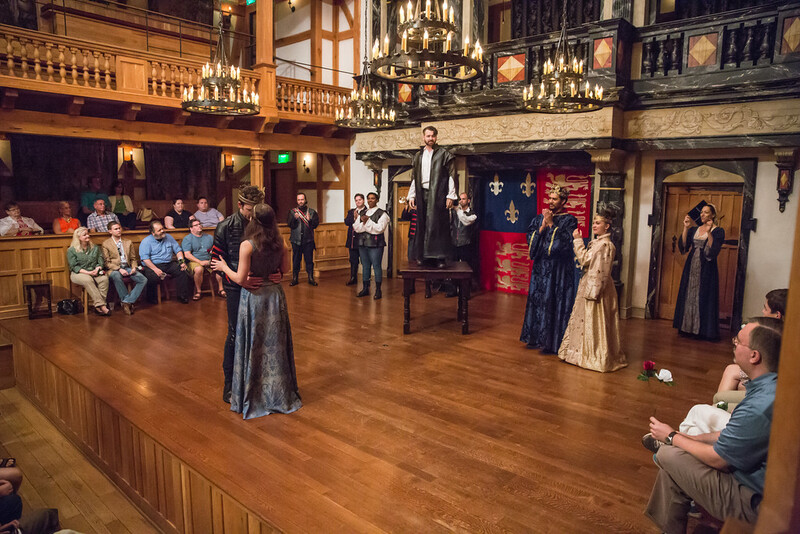 Patrick Poole and Aleca Piper in HENRY V. Photo by TOMMY THOMPSON. 2016. 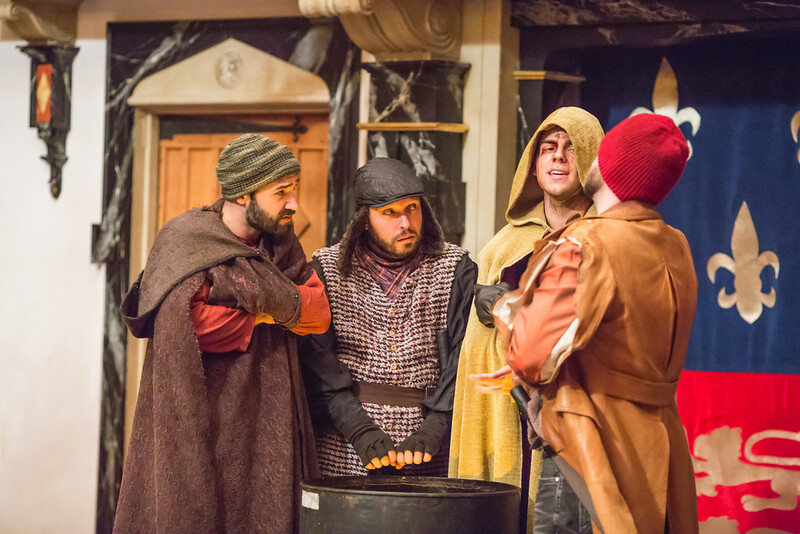 Patrick Poole, Chris Bellinger, Ross Neal, and Tim Sailer in HENRY V. Photo by TOMMY THOMPSON. 2016. 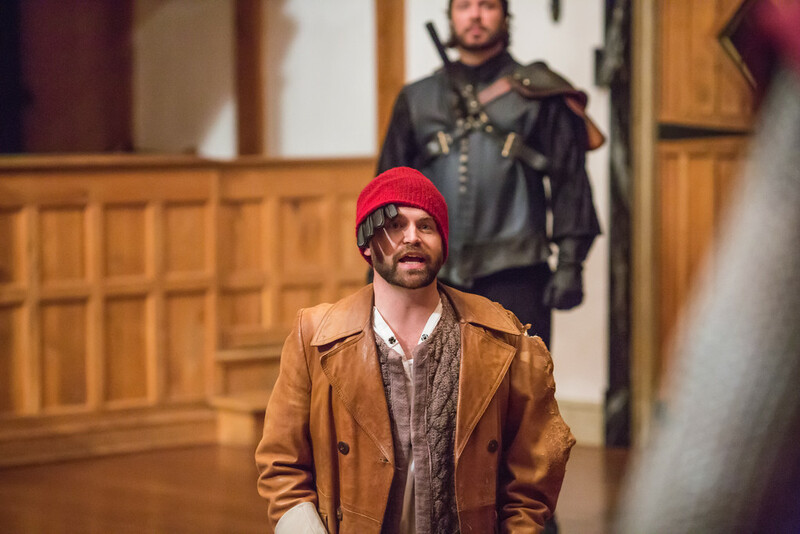 Tim Sailer in HENRY V. Photo by TOMMY THOMPSON. 2016. 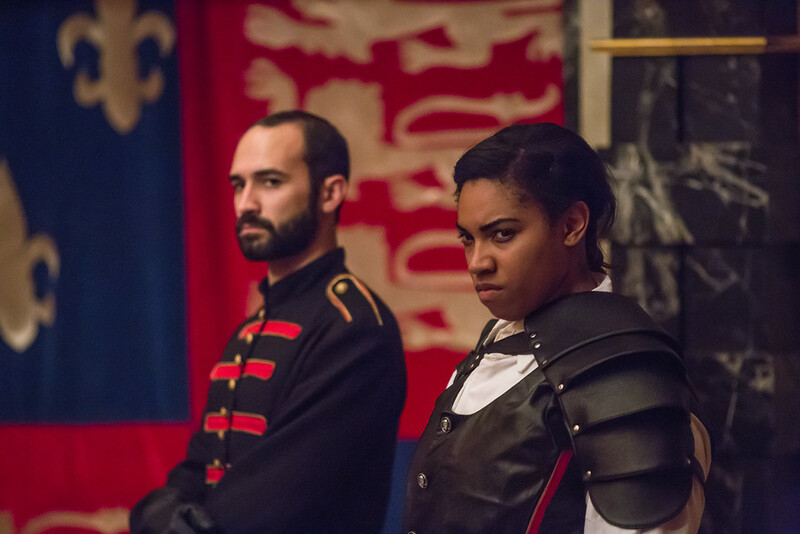 Ross Neal and Zoe Speas in HENRY V. Photo by TOMMY THOMPSON. 2016. 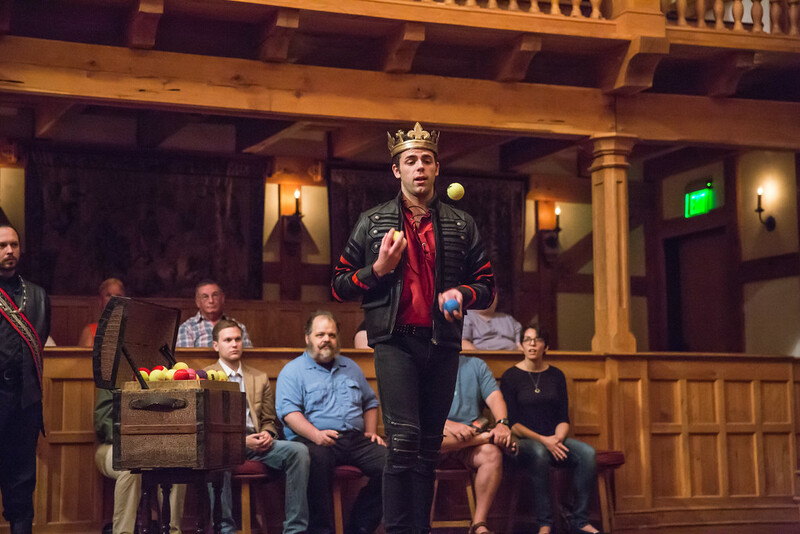 Prince Hal has led a riotous youth with his tavern companions Falstaff, Pistol, Bardolph, Nym, and Hostess Quickly. The bishops describe to King Henry the “Salic Law,” which the bishops interpret as entitling Henry to the French throne. At Agincourt, the night before battle: the French are confident of their superior numbers and yearn for the morning, when they expect sure victory. Meanwhile, King Henry disguises himself and walks about his camp to talk with his soldiers. Victory, grieving, wooing, and history ensue. IS IT A RABBIT OR A DUCK? YES. Multiple plays about King Henry V appeared on the English stage in the late 1500s; Shakespeare’s version was first printed in the Quarto of 1600 (Q1). The other major printing of Shakespeare’s H5 came in the 1623 first Folio (F). Q1 is a lot shorter than F. Q1 does not have the Prologue, Epilogue, or any of the Chorus speeches; it doesn’t have the famous-to-most-of-us “Once more unto the breach” speech; it eliminates the first scene with the bishops discussing Prince Hal’s reformation/transformation to King; and it cuts the Dauphin out of the pre-Agincourt tent scene where the French brag about their armor and horses. The over-arching result of these drastic cuts (along with some rearranging of scene order) is that Q1 streamlines the story to give us a heroic King without the darker shades of gray found in F.
Scholar Andrew Gurr is convinced that the longer F script represents the “maximal text” that Shakespeare wrote and handed over to the actors. Gurr believes that the actors did not perform the longer script in full; he thinks they drastically cut the script to remove any ambiguity about the nature of Henry’s character. Gurr posits that the Q1 script represents the “minimal text,” the one that the actors actually performed and/or prepared for publication.  In one of the most important modern essays on H5, Norman Rabkin compares it to an image from E.H. Gombrich’s Art and Illusion, the ‘rabbit/duck.’ This simple line drawing, like the play, can be perceived in one of the two distinct ways, alternately, but not simultaneously. H5 can be either the story if an ideal king leading a unified nation to a glorious victory, or the story of a crafty and unscrupulous politician embarking on a cynical war of aggression in spite of its human costs. Readers and directors have to choose whether their Henry is either a Christian king and heroic leader of his nation or a ruthless self-seeker who acts the role of good king for his own profit. He cannot be both. With all due respect: poppycock. The older I get, the more excited I am about the secret and not-so-secret stories Shakespeare weaves with amazing layers of ambiguity in every single play he wrote. The production you’re about to see follows F while using a few variants from Q1. We’re doing all the big scenes and speeches Shakespeare’s company may have cut when they performed the play. And we’re going to work our butts off to give you all of the flavors, colors, and seemingly contradictory facets that Shakespeare provides. Like all of Shakespeare’s major characters, Henry is not just one thing. He’s calculating and heroic; he’s patriotic and ruthless; and he gets the girl with one of Shakespeare’s most charming rom-com endings. 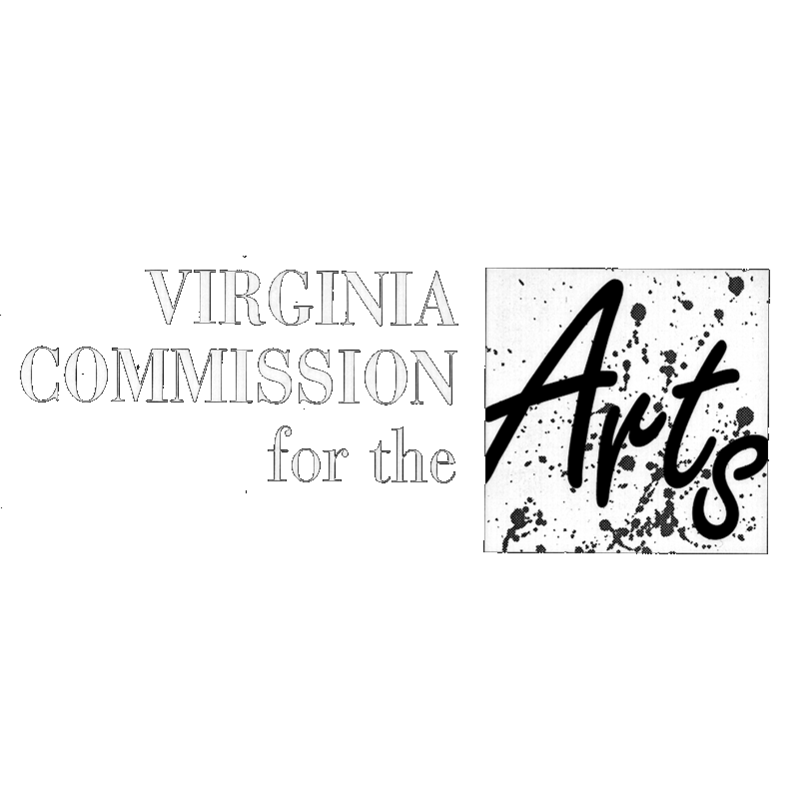 The title character (and the play) is a rabbit and a duck. Just like life.